More than 300 leading law firms rely on Redbooth for legal project management. 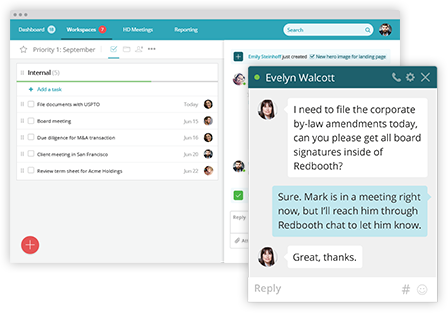 From partner discussions to intra-office discussions to attorney-client correspondence, with Redbooth you can consolidate all of your communications in one secure place. 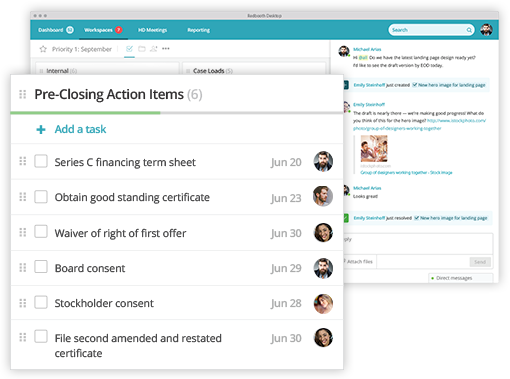 For live video conversations, Redbooth’s HD Meetings capability lets you easily videoconference and share your screen to review documents with other parties and annotate them in real-time. 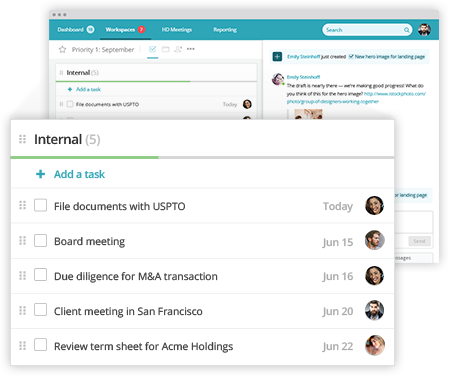 Redbooth’s intuitive hierarchy of projects, tasks, and sub-tasks keeps everyone on the same page so you can stay focused while managing a larger workload. Changes are documented as you iterate and tasks can be assigned to specific individuals, enhancing accountability. For projects that have predictable steps — M&A transactions, bankruptcy filings, venture financing — you can create your own task list templates inside Redbooth. Don’t waste time reinventing the wheel or worrying that a detail was missed. Utilizing custom workflows provide peace of mind and consistency. By enhancing your productivity and streamlining team communications, you will have more time to focus on billing hours and delivering the best possible experience for your clients. Our law firm has offices in Europe and California, and we stay connected internally and with our clients throughout the US and EU using Redbooth chat. I can get the status on any of my client work within seconds — anytime, anywhere.